Did the Higgs Signal Fade? The cause of this change was said to be the addition of some new data into the analysis, but I think this has to be looked at in more detail, so I have been doing some more combinations of the LHC data and am now working from the individual decay channel plots. The first clue that the story is not quite as straightforward as it seems comes when you look at what was said by CMS about the WW decay channels at the conferences. here first is the slide from Europhysics. You may need to click to see full-sized. This slide shows that there are two distinct analysis methods available, “Cut based” and “MVA based”. 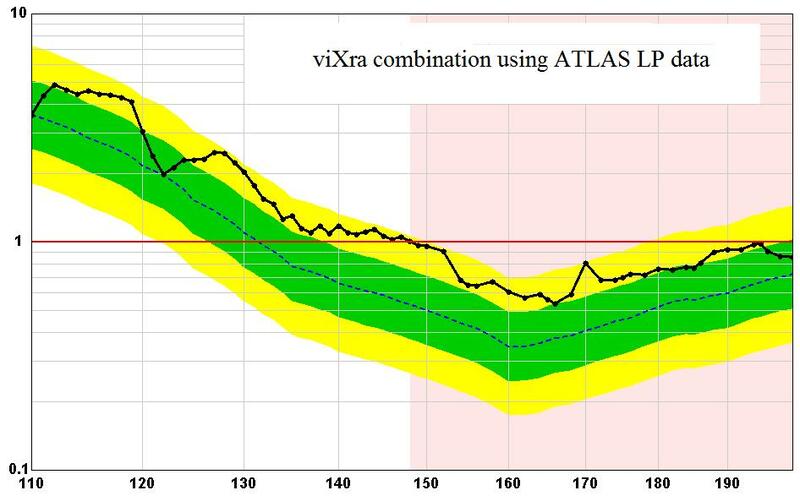 The MVA gives a much better result as shown by the lower expected CLs line. In fact it is about as good as twice as much data. You will also notice that the excess from the MVA analysis was bigger which is what you would expect if the signal is real. 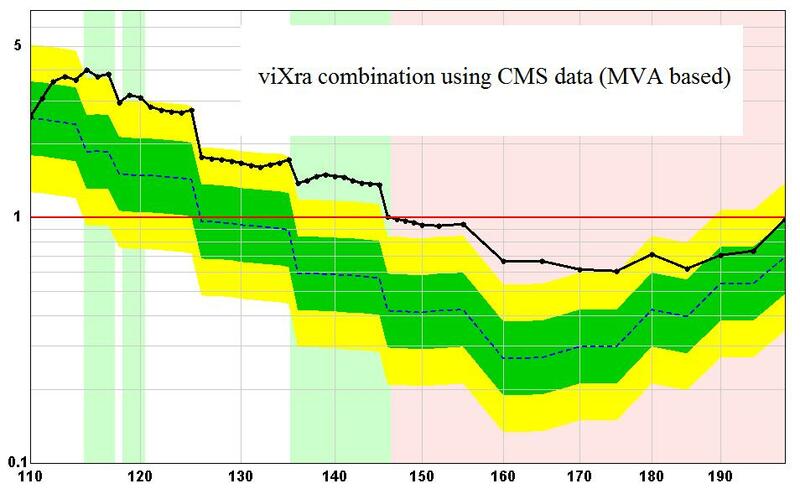 Indeed the MVA analysis was the one used in the final CMS combination for Europhysics. Now look at what they said at Lepton-Photon. This shows just the Cut-based analysis with a note that the MVA-based result is coming soon! They have used 1.5/fb compared with 1.09/fb at EPS but remember that the MVA method is as good as twice as much data, so in fact the data used for WW at EPS was better and they took a backward step. The WW channel dominates the plot over the crucial range where the biggest excess was observed. You can even see directly that the expected CLs line went up higher in the LP plot compared to EPS, so really they took a step backward. A fading excess is therefore exactly what we should expect. What we find is that there has been a small decrease in the excess in places, but not by much. The natural thing to do next is to construct the plot using the MVA based data from EPS for the WW channel with the other channel data from LP. Since the EPS data was better for WW we should get the best possible results this way. 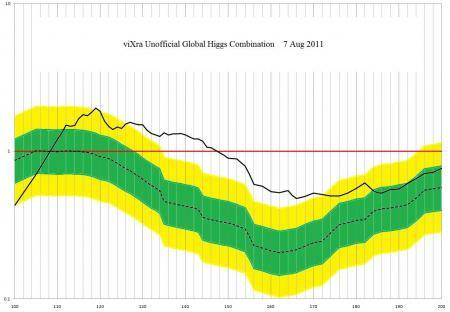 This brings back the broad excess previously seen with almost 3 sigma significance at 140 GeV. So what we can now say is that the observed decrease in the excess for CMS was mostly due to a change in the analysis rather than a statistical fluctuation as implied. What about the ATLAS data? They were reported to have an even bigger decrease in the excess from 2.8 to less than 2 sigma. Here are my plots reconstructed from individual channel data. There is some decrease in the excess but not as much as advertised. In fact the signal does not appear to have been as strong as originally claimed in the first place. Of course my combinations may not be as accurate as the official ones, but at least I can be sure the analysis has not changed, just the data. 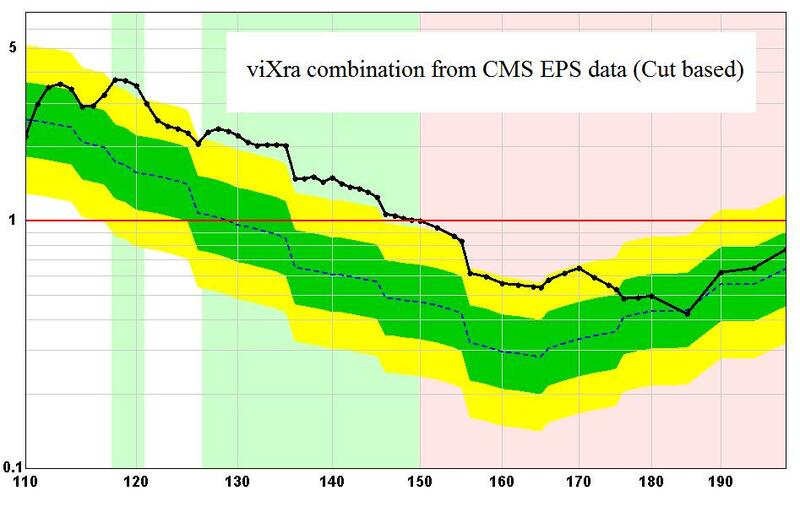 Conclusion: The CMS excess did not fade at all, the difference was due to a change in the analysis from Cut-based to MVA-based for the dominant WW channel. The ATLAS combinations when reconstructed consistently only show a small decrease in the excesses. Not the large decrease advertised. Higgs boson hints are still alive. There are a few interesting workshops and conferences on today that are presenting results from LHC and Tevatron. 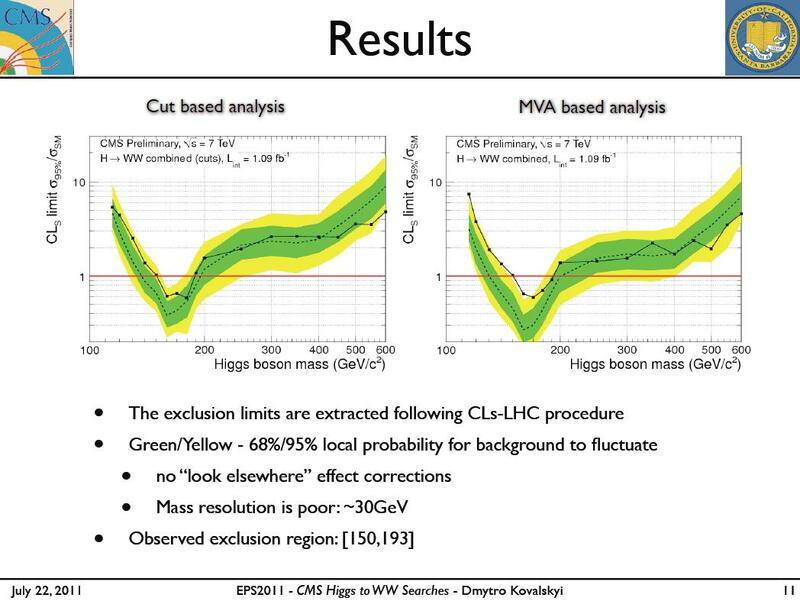 In particular the “Implications of LHC results for TeV-scale physics” meeting at CERN all this week is the most likely place to look for new results, and indeed the following plot has just been shown by Eilam Gross. This is an “illustrative” combination of the ATLAS and CMS Higgs searches which appears to be based on the data presented at lepton-Photon-2011. 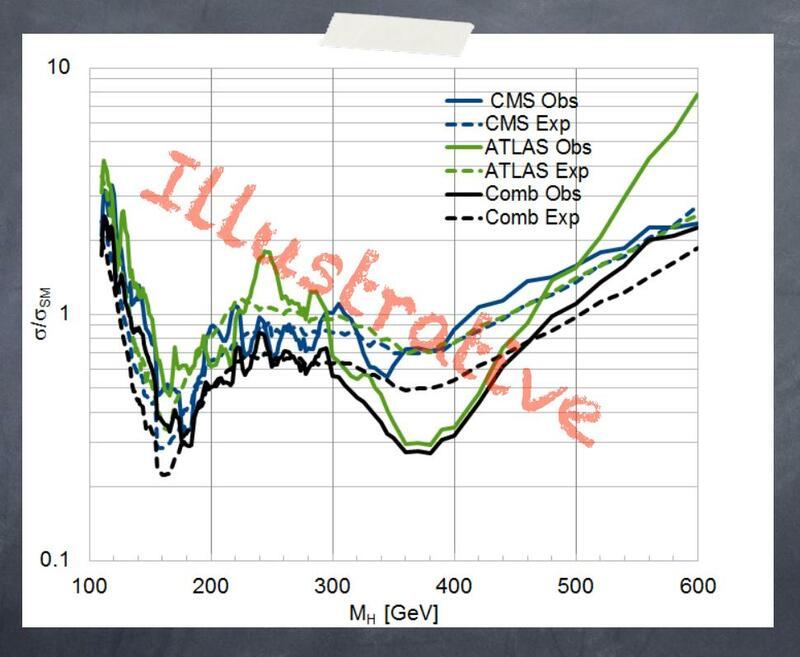 If you look carefully at where the black line crosses the 95% confidence level limit you will see that it excludes the standard model Higgs between 130 GeV and 480 GeV. A Higgs below 130 GeV disfavours the standard model on its own because of vacuum instability. It might be OK if the vacuum remains metastable with a sufficiently long lifetime but if the mass is a bit smaller then such a universe becomes a very dangerous place to live. The safer explanation would be that the light Higgs is stabilised by extra particles which would have to look very much like a Higgsino or a stop. I.e. SUSY. The excesses above 130 GeV are still there. 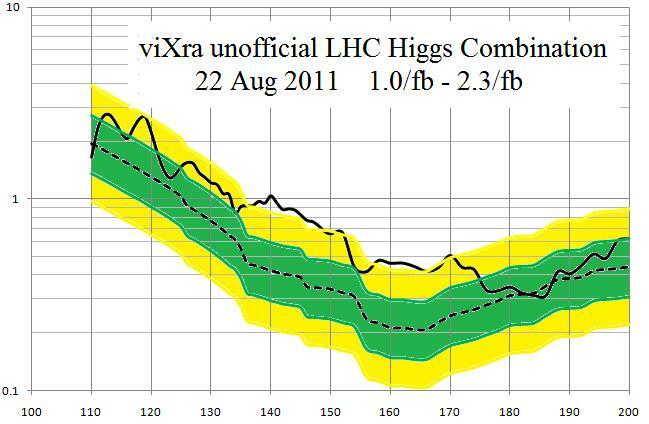 It is difficult to read their size from this plot but they are obviously not due to a standard model Higgs. They could be from another boson with a smaller cross-section, or they may just be the effects of uncertainty in measuring the missing energy of the neutrinos in the WW channel. The Higgs could appear at higher mass than 480 GeV, posing other problems for the standard model. Some completely unexpected signal of electro-weak symmetry breaking could emerge. Of course the plot is marked as “Illustrative” and I have no idea what other caveats the speaker has added (but see remarks in comment section from the speaker). Update: For the record it turns out that the above plot used a combination formula which is not too good for observed CLs. See comments from its constructor below. It would be wrong to use it to draw any conclusions. You should think of it as an illustration of how missleading a combination can be if not done correctly. 🙂 It was removed from the uploaded slides. My own combinations use a different formula which I believe is much better. They do not yet show an exclusion at 140 GeV. 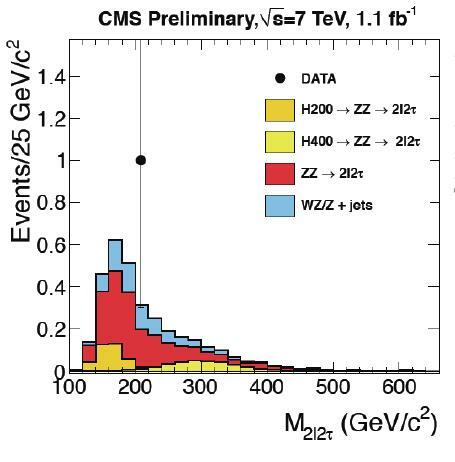 As you can see, with 1.1/fb CMS has observed one event in a channel that may give a signal of a Higgs through decay to two Z bosons which in turn decay to two tau leptons and two other leptons. This is consistent with standard model backgrounds shown. It will require about 100 times as many events for this channel to make any real impact on the search for the Higgs boson. Luckily the LHC will eventually record a few thousand /fb so this channel will be very useful. There are other channels with better cross sections but results ao far shown have still used just a few events, or they are swamped by thousands of background events. It is possible to combine several channels and compare with what is expected from a particular theoretical model such as a standard model Higgs boson or MSSM supersymmetry, but such models tend to work in a reduced parameter space and may not match reality well. In the case of supersymmetry they look at models where a stable lightest particle is in reach of the LHC so that it shows up in missing energy searches. It would have been nice if this led to a quick discovery but it hasn’t. Int ime each of these channels will be populated with lots of events and can be compared with standard model backgrounds. Bumps could appear anywhere leading to the discovery of some new particle. Once its properties are mapped through its different decay modes it can be fitted into a new model, which may or may not correspond to a supersymmetric multiplet. People are starting to say that supersymmetry is in a corner, or even that the LHC seems to be incapable of producing new physics. It is far too early for any such conclusions. We need to be patient. 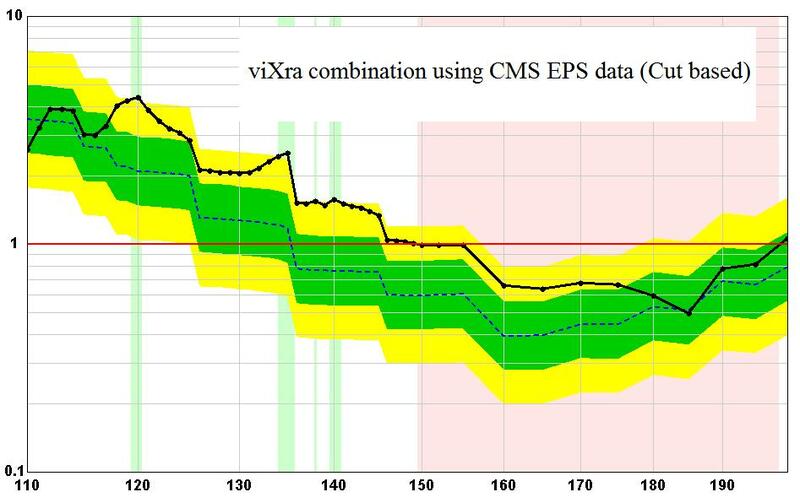 It is traditional to present the results of searches such as Higgs hunting as Brazil plots that show us where a signal can be excluded at 95% confidence, but when the data starts to show a positive signal it is better to show signal plots like the one below. This is just the observed confidence level limit minus the expected with the error bands for one and two sigma statistical variation shown around the signal level line. In this plot an absence of a Higgs boson is indicated by the black line being at the red zero line, but the presence of a standard model Higgs is indicated by meeting the green line at one. This gives a much clearer picture of what is going on. 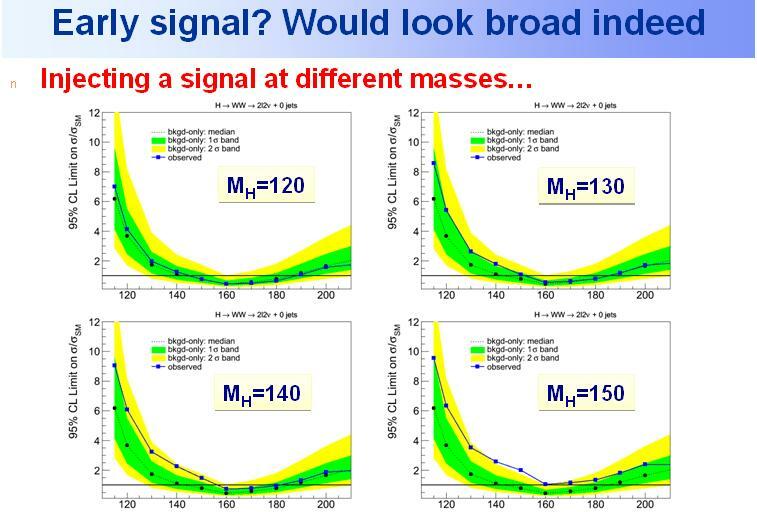 Above 155 GeV the signal is nicely consistent with no Higgs. Below 135 GeV the signal is right in the middle but the error bands are large and easily allow for either a Higgs or no Higgs. The middle region is more interesting. From about 135 GeV to 150 GeV it disfavours both a signal and no signal of a standard model Higgs. It is tempting to say that this rules out standard model physics in this region but I think it is too soon to draw such a conclusion. It may be that there is a SM Higgs boson at say 140 GeV but the resolution is not sufficiently good to get a clean signal there, or more data may see the line fluctuate down to the no signal level. It is important to remember that we are still at the stage where just a few signal events have a big effect on the curve. More detail will emerge with more data. Furthermore, the plot above is only an approximation that does not properly take into account all uncertainties and correlations. The LHC is now entering a Machine Development and Technical Stop phase for the next two weeks with 2.5/fb recorded in each of ATLAS and CMS. There are no big conferences on the horizon but both experiments have CERN seminars scheduled for the middle of September. With luck they might update all the channels and give us another update soon. Hopefully they will also do some official combos for both exclusion and signal plots. In case you were wondering what it would have looked like with the EPS data, here it is. The previous Combo after EPS was consistent with a standard model Higgs somewhere between 125 GeV and 145 GeV, or a more complex mixture of bosons over a wider range. 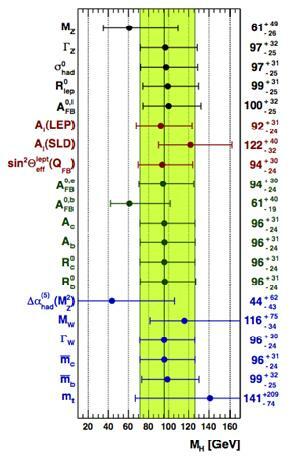 The conclusion has now swung back away from the standard model with masses above 135 GeV all but eliminated. There is still a signal for something but it is much less strong than before. 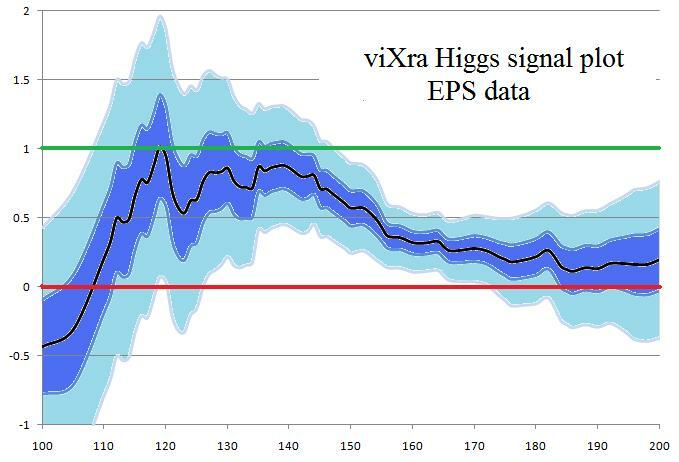 The 3-sigma “observation” that CERN could have claimed has gone. Technically there is still a chance for a boson at around 140 GeV, and a standard model Higgs boson is not excluded around 130 GeV but in that case the vacuum would be unstable or metastable unless there is something else such as superpartners. The Higgsless models have also been resurrected with an outside chance that the excess could fade away completely. 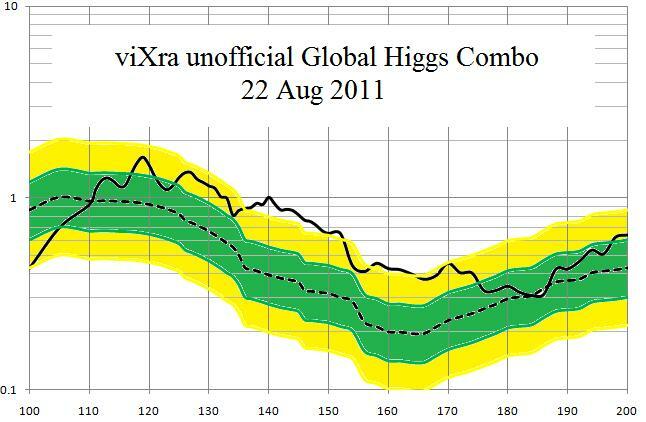 The case for a lighter Higgs at around 120 GeV is still wide open. If you are wondering what it looks like with the Tevatron data added, the only difference is at the low mass end. Conclusions don’t change. As we wait for the Lepton-Photon conference to begin, ATLAS have released some new Higgs combination plots in a conference note. These have added 2.3/fb in the H->ZZ->4l channel and 1.7/fb in the H->WW->llνν channels. 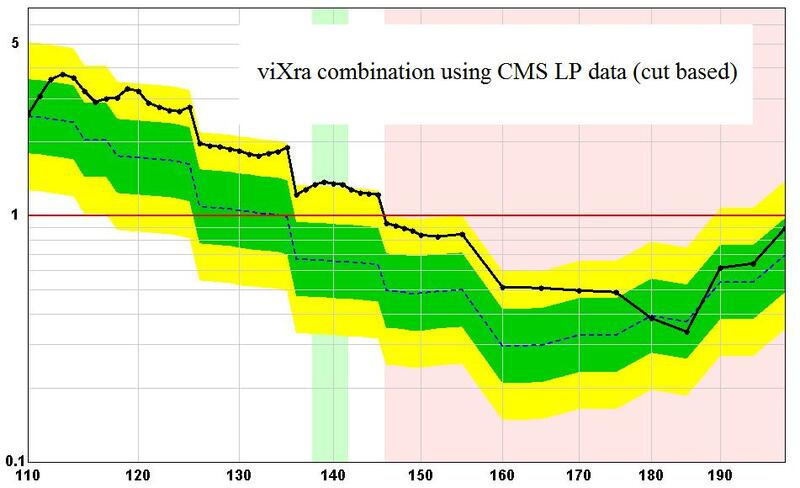 CMS is also showing plots with 1.7/fb at LP11 now. Things are not going as predicted. 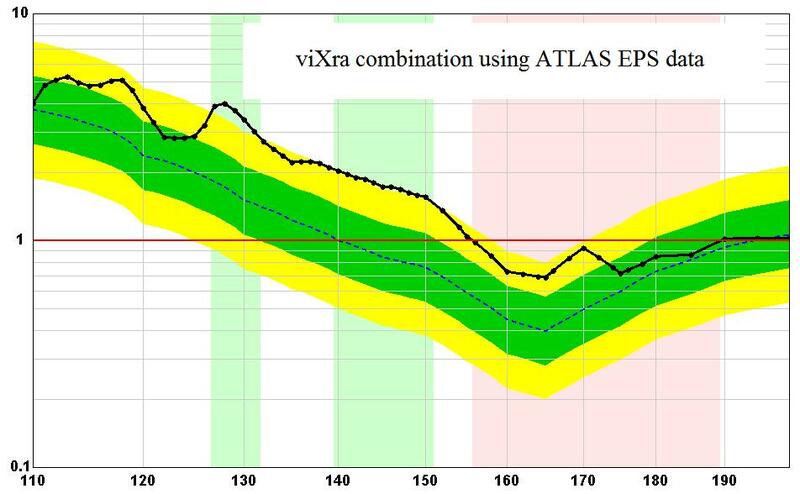 Instead of showing a combination of the ATLAS and CMS data from EPS they are showing individual plots with more data. Great news! There is a press release from CERN that plays down the excesses seen at EPS pointing to the fact that they have diminished with the new data. One reason why they probably do not want to show the combined plot from EPS is that it strengthens the excess and this could lead to premature conclusions. You have to remember that these excesses are still based on a very small number of events so there are going to be fluctuations like this until more data has been gathered. Has the LHC seen a Higgs Boson at 135±10 GeV? Once again rumours are circulating that the Higgs Boson has been seen and now they are more stronger than ever. 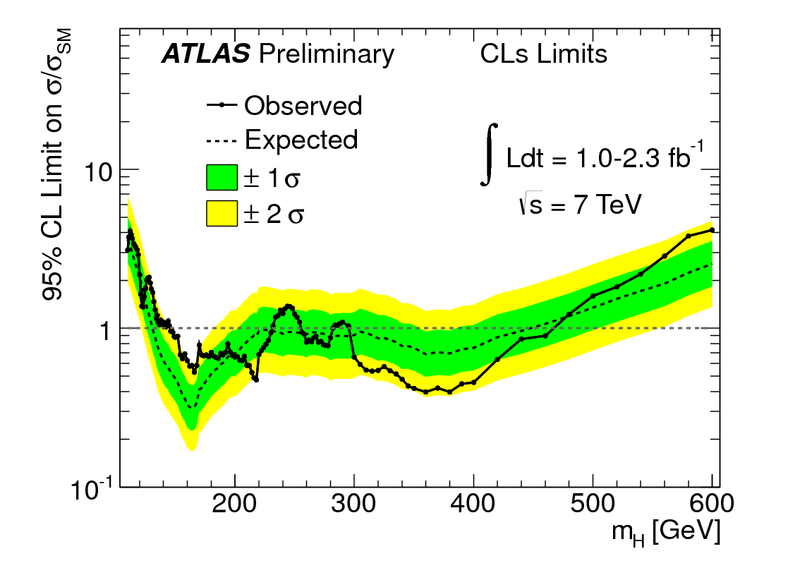 At the EPS conference it was seen that both ATLAS and CMS have an excess of events peaking at around 144 GeV. Fermilab had a signal in the same place but much weaker. At the Lepton-Photon conference starting 22nd August ATLAS and CMS will unveil their combined plot. The question is, will the combined signal at 144 GeV be enough to announce an observation over 3-sigma significance? Needless to say some early versions of the combined plot have already been leaked but rather than show results that may change I am just going to discuss my own unofficial combinations that are not very different. 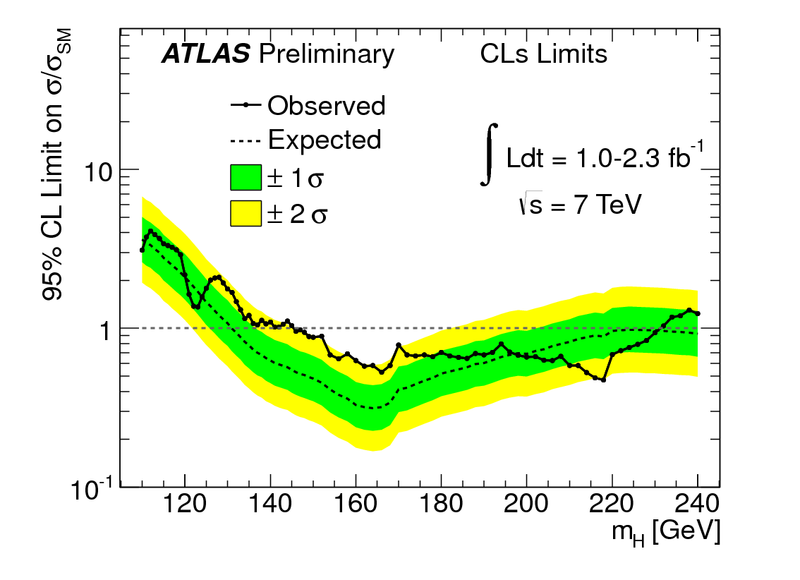 So here again is my combined plot for CMS, ATLAS and the Tevatron. This shows a brought excess peaking at 144 GeV where it is well over 3-sigma significance. It extends from 120 GeV to 170 GeV above 2-sigma most of the way but it shows an exclusion above 147 GeV at 95% confidence. The signal is the expected size for a standard model Higgs boson from 110 GeV up to 145 GeV but is excluded by LEP below 115 GeV. What could it be, a Higgs boson, two Higgs bosons or something else? The width of the Higgs boson is determined by its lifetime and at this mass it should be no more than 10 GeV. However there is a lot of uncertainty in the measured energy in some of the dominant channels. 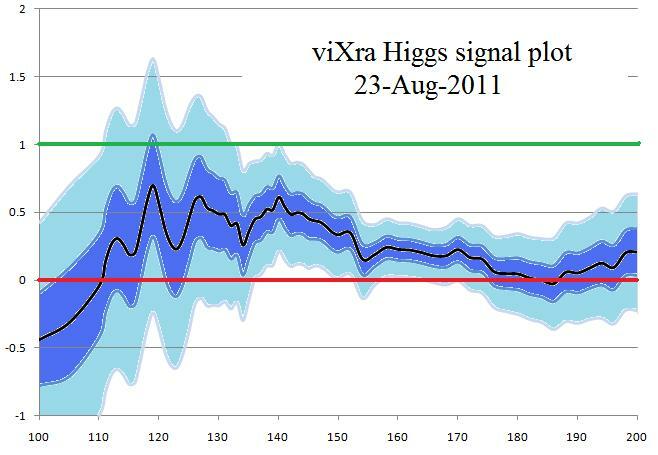 Some useful plots shown at Higgs Hunting 2011 by Paris Sphicas show what a simulated signal looks like in the WW channels and it is clear from these that a Higgs boson at 130 GeV or 140 GeV is perfectly consistent with the broad signal now observed. There is also a hint of a signal around 120 GeV but it is not strong enough for a claim. I would say that overall this plot is consistent with a single Higgs boson with mass between about 125 GeV and 145 GeV or more than one Higgs boson in the range 115 GeV to 150 GeV. Whatever it is, the significance is enough to claim that a Higgsless model is now unlikely to be right unless some other particle is mimicking the Higgs boson in this plot and it is probably a scalar. Afterall, we can’t really say that the signal is definitely a Higgs boson until we can confirm that it has the right cross-section in some of the individual channels. What does this say for SUSY and other models? The MSSM requires a Higgs boson below 140 GeV. In detail the signature would be different from the standard model Higgs boson. If there were a Higgs below about 130 GeV the vacuum would be unstable (but perhaps metastable) I think something as light as 120 GeV would be hard to accept as a standalone Higgs boson and would have to be stabilised with something that looks like either a SUSY stop or a Higgsino. On the other hand a 140 GeV Higgs can easily exist on its own and requires no new physics even at much higher energy scales. At this point we cannot rule out either MSSM or a lone Higgs boson. Earlier I said that the electroweak fits could kill the standard model and that is still the case. At Higgs Hunting 2011 Matthias Schott from the gfitter group told us that a Higgs at 140 GeV has just a p-value of 23% in the fit which includes the Tevatron data. This is far short of what is required to rule it out but it tends to suggest that there may be something more to be found if the gfitter data is good (count the caveats in that sentence.) So just how good is the gfitter data? This plot shows the effect on the electroweak fit of leaving out any one of the measurements used. 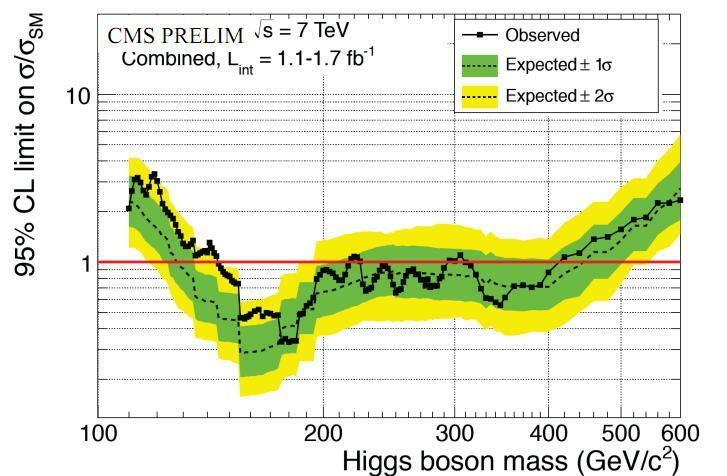 The green bar shows the overall preferred fit for the Higgs boson mass giving it a mass of 71 GeV to 122 GeV. But anything below 114 GeV is excluded by LEP. Anything below 122 GeV would certainly favour SUSY which is why this plot has been encouraging for theorists who prefer the BSM models. Indeed it is possible to get a much better fit to the data with just about anything other than the standard model. How seriously should we take this? To get back some sanity have a look at the effect of the Al measurement. 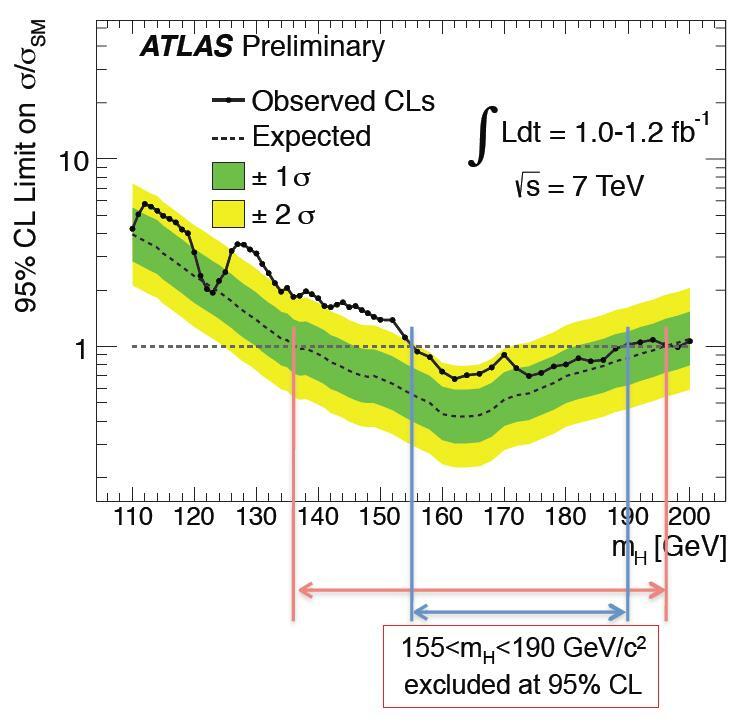 The fit includes two separate measurements of this parameter, one from LEP and one from SLD (SLAC Large Detector). The reason for using the two is that they disagree with each other at about 2-sigma significance. This could just be statistical error in which case we should use the combination of them both, but suppose it is a systematic error in one or other of the experiments, such as a mismodelled background? 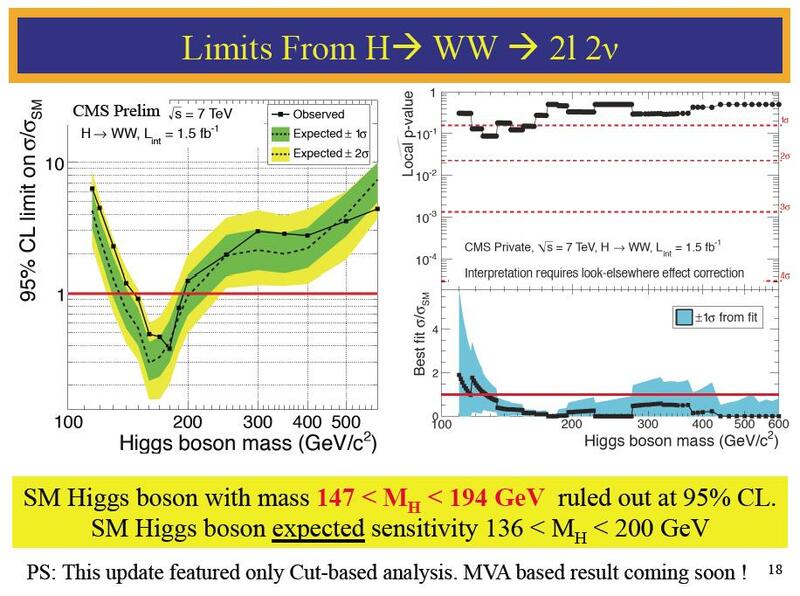 Removing the SLD measurement would push the preferred Higgs mass up and widen the error bars so that anything up to 160 GeV becomes a reasonable fit. This is just one example of how a measurement could compromise the fit. That being the case I think we should not take the fit too seriously if we have good direct evidence for something different, and now we do. From reliable sources I am expecting CERN to issue a press release about the status of the search for the Higgs Boson next week in advance of the LP2011 conference. If the official Higgs combination is similar to my version (the leak shows that it is) then they have the right to claim an observation (but not a discovery) of a strong signal consistent with a Higgs boson at 144 GeV (or soewhere else nearby). They cannot excluded other BSM signals including MSSM. I don’t know exactly how they will spin it but they will want the media to take notice. For more details we will need to await the next analysis. Given present results and the extra data already recorded I am sure we will not have to wait too long. You are currently browsing the viXra log blog archives for August, 2011.